With weddings becoming the biggest social statement for most Indian families, a bill that proposes to target the usually ostentatious celebrations has stirred a lively debate – can Indians be persuaded to cut down on the size and scale of marriages? The big, fat Indian wedding is no longer restricted to the rich. As a booming economy has put more money into the hands of the middle class, they too are staging extravagant, multi-day celebrations at five star hotels and farmhouses. A member of parliament from Bihar, Ranjeet Ranjan, is introducing a new bill in parliament called the Marriages (Compulsory Registration and Prevention of Wasteful Expenditure) Bill 2016, which proposes that those who spend more than $ 7,500 on their wedding should donate 10 percent of the money to a government fund, which wold be used to fund marriages of poor girls. 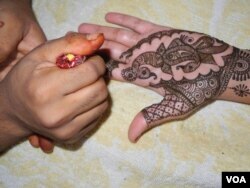 It also seeks to put a cap on the number of guests and dishes served at wedding functions. Indians spend thousands of dollars on decor to transform banquet halls in five star hotels and farmhouses for marriage functions. Estimates show that many Indian parents fork out one fifth of the wealth they have accumulated on hosting a wedding. While budgets vary widely, many middle class families shell out $50,000 to $100,000 for their children’s nuptials. In a country that holds some 10 million marriages a year, India’s booming wedding industry is estimated to be worth about $35 billion and racing ahead at 30 percent a year. It is often described as a recession-proof industry, untouched by financial downturns or economic slowdowns. New Delhi resident and finance professional Pradeep Bhargava, who has hosted his daughters’ and sons’ marriages in recent years, feels wedding spending has gone a step too far. “We are going 100 percent overboard, trying to show off, trying to be one up,” he says. Many of these parents recall that their own weddings some three decades ago were relatively simple affairs where family and friends sang wedding songs at home and cooks prepared traditional delicacies. But that’s history. Now as an aspirational middle class joins the race to put up a grand show, elaborate ceremonies spread over two to five days have become the norm -- from putting henna on the bride to choreographed dance shows, grooms arriving on chariots and elephants and exotic wedding feasts with several types of food available. Event managers and wedding planners are no longer just the purview of the rich. 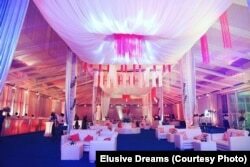 The spending on décor alone can run into the thousands of dollars said Pooja Gupta from New Delhi based Elusive Dreams, which specializes in adding glitz and glamour to wedding venues. “They want new themes that come out every season, and they really want to transform the face of the venue, and they are willing to spend whatever, unlimited. They want to outdo each other at the wedding,” she said. Many people vehemently oppose any effort to impose a tax on wedding expenses and say any effort to trim lavish Indian weddings has to be led by society itself. 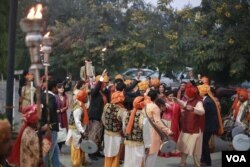 However, lawmaker Ranjeet Ranjan said many people would welcome an escape from the extravagant spending that weddings now involve. “The response I am getting is that a lot of people who spend due to pressure from society will be happy to get the shelter of the law,” according to Ranjan. The lawmaker, who is from the opposition Congress Party, said she has found strong support for her bill, which could be taken up in the next session of parliament starting in March. Although new legislation typically takes years as it winds through the two houses of parliament in India, she is confident it could pass if the government supports it. The ruling Bharatiya Janata Party (BJP) has not yet taken a position on the proposal.